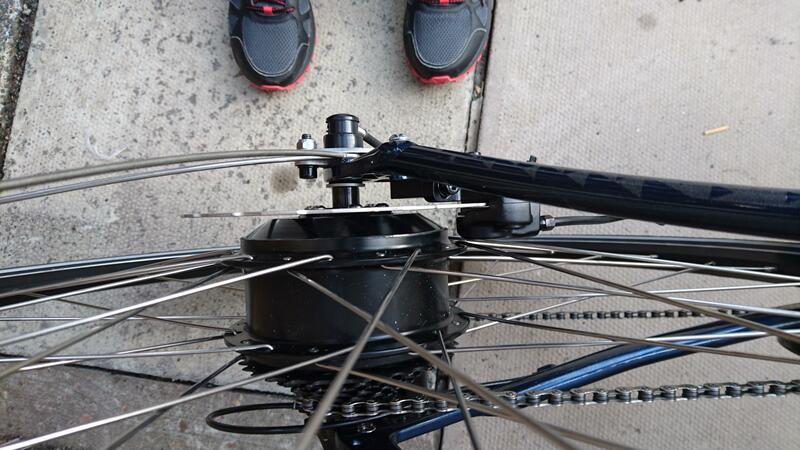 25mph on the flat @ ~600W, 20kg bike weight. Warning: long post comming up This is mostly a brain dump of everything that I did for my recent build in the hope that it will be useful to somebody else considering the same, and so I can refer back to it when I next do a similar build. I'm going to write this in as much detail as I can while it's still fresh in my mind, but if there are any questions please ask. Let me emphasize that I am a complete beginner at this; this is the first ebike I've ever built or even seen so take everything I say with a grain of salt and if I say anything stupid, please correct me in a reply! Before I start, thanks are due to everyone who helped me with questions, especially d8veh, Nealh, anotherkiwi, KirstinS and awol. I'm going to write out the steps as if I did them all correct first time to make it easier to read, but I had to ask for helpl with basically every step. As others have pointed out, there's absolutely no need for a new bike, but I was having trouble finding a second hand one locally that had my desired combo of 700c wheels, disc brakes and a small frame, so when I pulled the trigger on an end-of-season deal and bought the Specialized. The battery was probably overkill for my original requirements, but the cost for the bigger battery was not too much and I though it might be handy to have a longer range sometimes. various different torque arms, a generic throttle and some power assist sensors. I bought a few different types of torque arms and PAS sensors cos I didn't know which would fit my frame the best. With the motor on, the rest of the build went pretty smoothly. 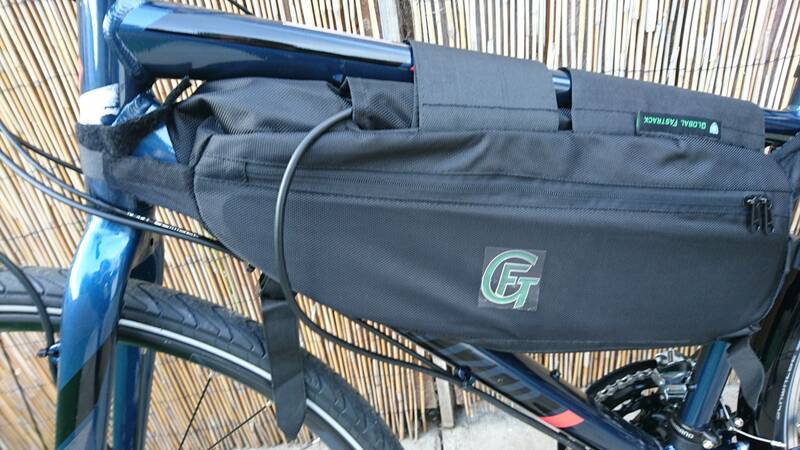 I fitted a frame bag to hold the battery and controller. I was originally going to use the very nice frame-mounted battery bracket that came with the battery, but I am sometimes going to have to leave the bike locked up and didn't want a big, obvious battery sitting on the frame. In the end I'm very happy with the frame bag, it keeps everything nicely contained and makes me more confident about waterproofness as well. Since I wasn't using the frame mount I took the mounting bit off the battery leaving me with just a neat two-prong terminal to connect to. On the left I have the throttle and LCD buttons in between the grip and the brake. This was surprisingly easy to fit and surprisingly comfortable to actually use. The LCD fits in the center of the bars. The cables for the throttle and LCD go to the stem and into the frame bag through a hole in the top. The cable from the motor comes from the back wheel, along the chain stay, up the down tube and into the bag through the same hole. 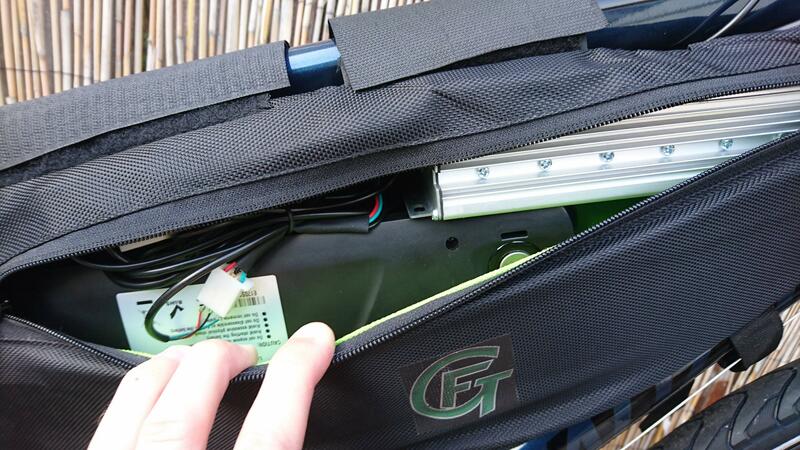 Once inside the frame bag, everything connects to the controller, including the power cables from the battery. There should be a bit more room once I've tidied up some of the wiring. First off, this bike is heavy. With everything installed, it weighs just over 20Kg. However, all the weight is nicely centered and secured, so pushing it around and pedaling unassisted it just feels like a very heavy normal bike. The indicated no-load speed, with the back wheel off the ground, was 27mph. To tell the LCD that my wheel size was 700c I had to put it into setup mode, which was not documented anywhere in the manual, so for anyone else who buys it you have to hold down both up and down within 5 seconds of powering on. This also lets you change from Km to miles. On the flat, with the throttle fully open, I was getting an indicated speed of around 25mph with no pedalling. I checked the speed on the LCD against a GPS reading and it seems pretty accurate, so I'm happy to trust the LCD speed in the future. The bike was an absolute blast to ride: smooth, silent, predictable power delivery, good handling and I got used to using the throttle in a few minutes. The motor had no problem maintaining 25mph on long stretches so I'm very confident that I'll be able to average 20mph on my commute. Power draw was around 500-600 watts on the flat @ 25mph. I saw it peak at around 1000W on a hill with wide open throttle. I didn't see any movement from the axle or torque arms, so I'm happy that they're doing their job. I did around 10 miles with the throttle wide open and was still at 3 out of 4 bars of battery, so I'm feeling good about managing a 20 mile round trip without charging if I have to. On the return leg of the ride I found a long straight road and did a solid 5 minutes at 25pmh, then stopped to check the tempterature - the motor and controller were barely warm to the touch, so no worries there. Next time I go out I'll bring an IR thermometer and find a hill to give it a proper torture test. Now that I'm happy everything is working OK, I really need to tidy up the controller wiring inside the bag. I'm planning on soldering everything that I can directly to the controller, as I should never have to remove it except for maintenance. 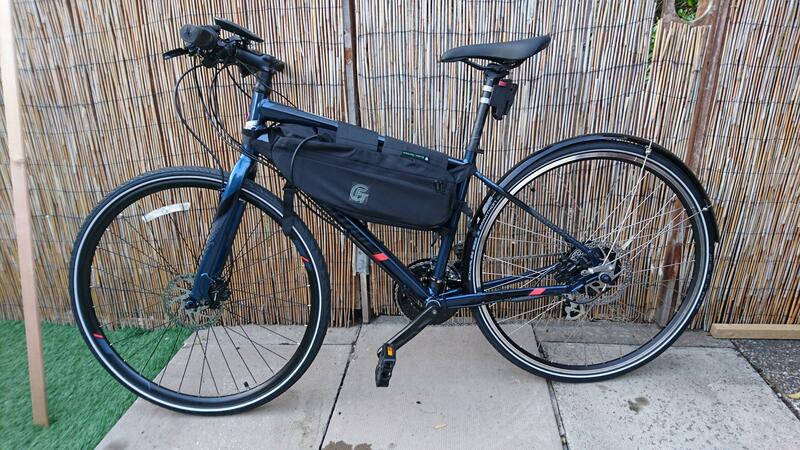 I'm going to fit a pannier rack for carrying more stuff. I will try commuting a few times with the throttle, then fit the PAS so I can see which one I like better. Do I need to have some sort of kill switch? In other words, if the throttle fails, will it fail closed or open? Any questions, comments, or advice appreciated! 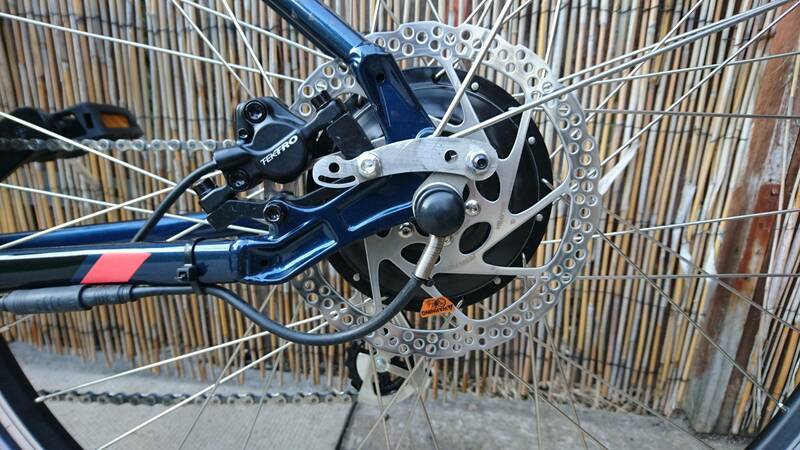 I'm not sure you need the washer on the inside of the non-drive side dropout, then just loosen and reposition the brake caliper. Your battery should easily do 20miles. 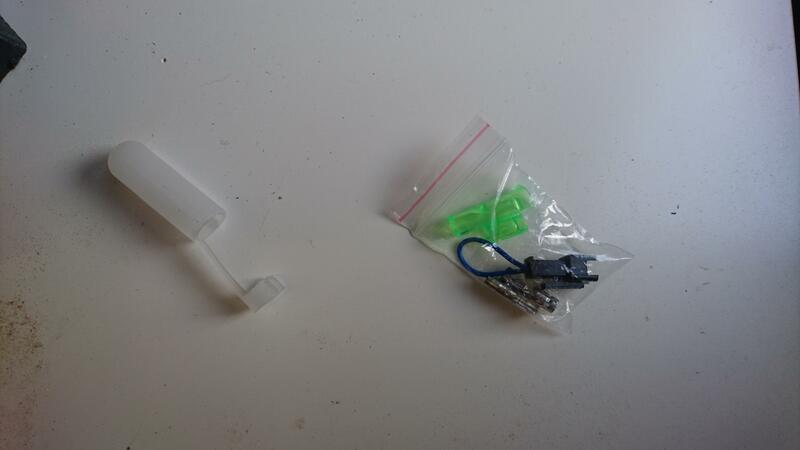 The parts in the last photo are a motor plug protector cover for during delivery/motor storage and a jst plug to trip out the cruise control and looks like some spare bullet pins+green covers. Fit the PAS too, they are great to use. I like your throttle, where did you get it? Clear plastic bit is the motor wire cover to protect the exposed pins in transit etc. The blue wire connector is for cruise control and joins the black and blue wired SM2 connector together. PAS uses less power so will increase range, throttle makes you lazy. Throttle if any issue will be in the open position, one brake cut off or a kill switch/button would be good (rain/moisture shorting is the usual culprit ). The motor wire looping up in to the frame bag would be neater entering at the bottom from the frames seat tube, burn a neat hole with a hot solder iron. Also just keep an eye on the drive side with no torque washer. 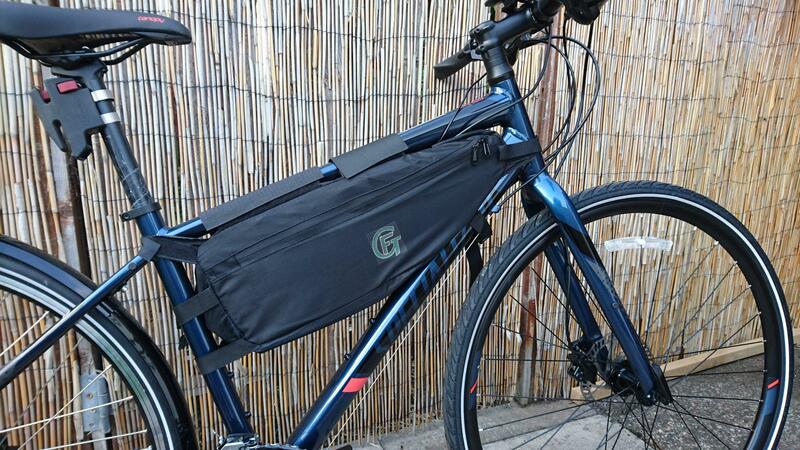 GFT frame bag was it imported or sourced here ? Also liking the throttle not seen that model before. Don't be tempted to fit the cruise control unless you have brake switches. Fit the PAS as soon as you can. You'll like it much more than the throttle, and it gives access to lower power without affecting the speed. I am still deciding on my donor bike right now and haven't purchased anything as it will affect my wheel size. Have you ridden further trips to ascertain your range with that setup yet? I put a washer on the inside of both sides as I read somewhere that it was better to have a larger surface area to clamp the axle between the dropouts. 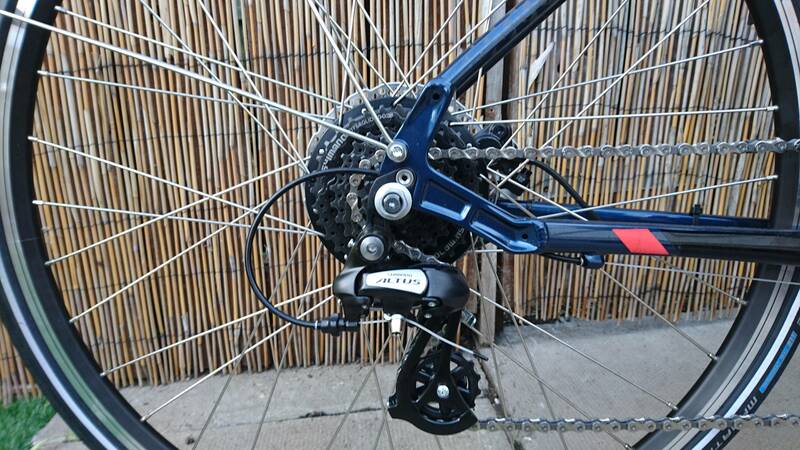 If they're not needed then I might remove them and re-align the brake caliper as you suggest, it would certainly make getting the hub into the dropouts a bit easier. there were a bunch of others but I thought this looked like it would be easy to fit (which turned out to be the case). Good idea about putting a hole in the bag: I have a fair bit of modification to do to the bag anyway (mostly sewing in something to hold the controller securely when I take the battery out to charge). I haven't done any more trips yet to figure out range; when I have time I'll go ride a circular route that doesn't take me too far from home and see how far I get before the battery runs out. Is the lack of a torque arm on the drive side going to cause me any problems? I could probably rig up a second torque arm using the bits that I've got, though I'd have to make a p-clip to attach it to the frame as there are no convenient mounting points on that side. If you ride at 24mph without pedalling, you'll find yourselfin trouble. Regarding bag, I'd have gone for one from Alpkit they can make them bespoke and are now totally waterproof, invaluable in winter. would be ideal for storing battery+controller with room left over! Danielr is a forum member, I forgot he had ebay listing. Just ordered mine from here. Found a bit more time to work on the bike today, and had another shake-down ride. I've soldered the motor leads (power and sensors) directly to the controller, and re-routed the cable in through the bottom of the bag as per Nealh's suggestion. This removed quite a lot of unnecessary cable length from the bag and made it a bit neater inside. I did the same with the LCD wires, then fitted the PAS. Got the cranks off easily enough, but the bottom bracket end just refused to unscrew (and I was taking big chunks out of the incredibly soft metal and mushing up the splines) so in the end I just epoxied the sensor on to the BB shell, which worked fine. 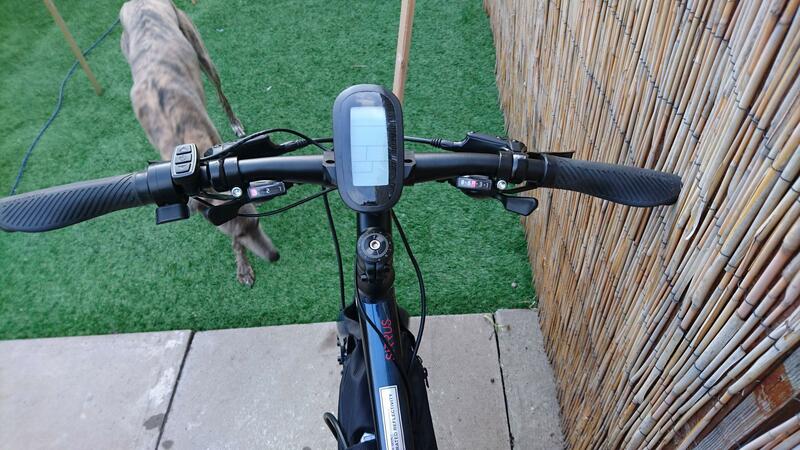 Riding with the PAS is very nice and intuitive - I just need to get out of the habit of slowly pedalling forward to downshift when coming to a stop. I had time for a slightly longer test ride: 19 miles in 51 minutes @ 22mph average. This time I got the battery down to 2 out of 4 bars before I had to call it a day. I was deliberately being as hard on the battery as I could; full power assist all the time and minimal work from me. With this longer ride I could notice the power drop a bit more, I was doing 27mph on the flat hot off the charger and 24mph on the same stretch at the end of the ride. Sounds good and you got the bike you was looking for. The diy route is often the way to go to get the performance you require to match your needs. The battery voltage when empty is 75% of what it is when full. current is fixed by the controller, so the change in voltage has a direct effect on power. Note that 2 bars out of 4 isn't half full. It's more like 1/3 full.